Secede to succeed against the criminal federal government? Colorado isn’t alone. There have been other secession movements in Northern California; Southern Oregon; Pima County, Arizona; the Upper Peninsula of Michigan; and Western Maryland. However, none have landed on the ballot. Generally, Democrats will block these measures. When the political world was focusing on two gubernatorial elections on election night in November, five mostly rural and agricultural counties voted to succeed from Colorado and form a 51sst state that would be named North Colorado. It further demonstrated there is a growing rural/urban divide in the United States that is going to get worse in coming years. The secession question was not a formal initiative but instead was intended as a sort of straw poll to see if residents supported the idea of breaking away or not. The question actually was on the ballot in 11 counties and failed in six of them. The secession movement began when Democrats took control of the legislature and began passing bills opposed by many rural voters – including gun restrictions. The secession question passed by a wide margin in rural counties on Colorado’s eastern plains. For instance, 62.2 percent of voters in Phillips County on the Nebraska border voted for it. So did 59.6 percent of voters in Yuma County on the Nebraska line and 62.2 percent of voters in Cheyenne County on the Kansas state line. Secession failed by a large margin in more urban counties closer to Denver and Colorado Springs. For example, 57.4 percent of voters in Elbert County, which is becoming increasingly suburban, and 56.3 percent of voters in Weld County which is also becoming suburban, were against it. 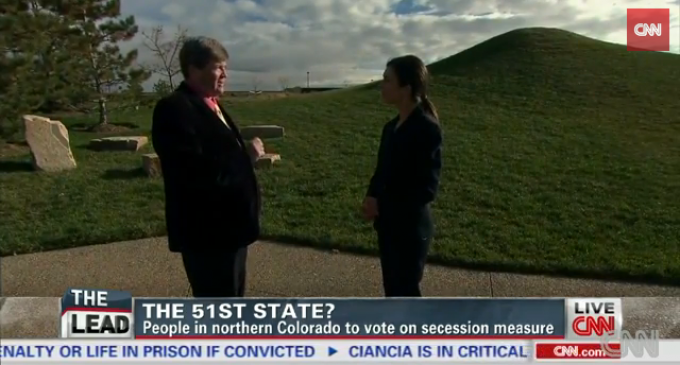 The closer you get to Denver, the more voters were against secession. The secession movement was centered on the Eastern Plains. It wasn’t on the ballot in most of Colorado including the mountains and the Western Slope. Despite some press reports, most rural counties in Colorado did not consider secession. John Eidsmoe rights the faulty historical record and brings us back to the roots that made America great . . . The roots of Colorado’s secession movement are fairly easy to ascertain. Residents in some counties feel that they are being completely ignored by the state legislature. A state school funding system that’s critics say is so unfair to rural residents it led to a lawsuit against the state by a student in a rural high school. An almost complete lack of funding for rural highways, some of which are now falling apart. Meanwhile, large amounts of money are available for a massive expansion of highways and the rail transit system in the Denver area. Growing disputes over water, which is increasingly being diverted from agricultural uses to Denver suburbs like Aurora. Aurora’s city government has been buying water rights and drying up farmland to support development for years. Restrictions on oil and gas drilling and exploration. A mandate that would require rural electric cooperatives in Colorado to get 20 percent of their power from renewable sources by 2020. Some people believe this will lead to higher electricity costs for rural residents. Stricter gun control laws passed earlier this year. This included limitations on the size of magazines. A lack of representation at the statehouse. Eighty percent of Colorado’s residents live on the Front Range — the Fort Collins-Denver-Colorado Springs-Pueblo Corridor. The counties that voted to succeed have just two state representatives and one state senator. The Colorado State House of Representatives has 65 members and the Senate has 35 members.